Research prior to archaeological investigation indicated that the Cadiangullong Store was located in the group of buildings shown on historical photographs in 1905-1907 and 1907-1909. The Post Office Map of 1914 also identified this as the site of the Store, Bakery and Post Office. As with all the other excavated areas, a survey plan was prepared before excavation, revealing the likely sites for a number of buildings, but nothing could prepare the archaeologists for the complexity of the buildings and other structures in this area, as indicated on the excavation plan. 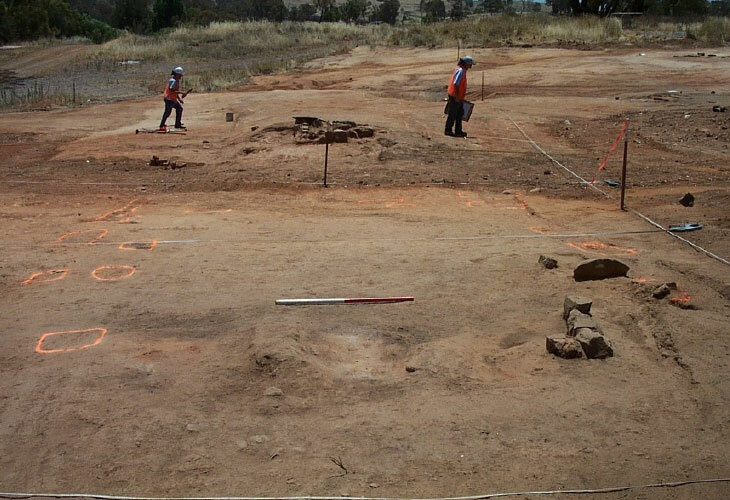 In all, the excavation pinpointed nine other structures apart from the Cadiangullong Store, not including outdoor toilets or shelter sheds for farm stock. All these buildings were located within a fenced enclosure. It was not until after the excavation was completed that it was realised that the fence defined Alured Clarke’s one acre, which he had leased from the Scottish Australian Mining Company on 29 September 1861 for seven years. It then became obvious what a group of the shopkeepers had done to give themselves some security of title: they had clubbed together, either sharing the lease or sub-letting from Clarke, so that they could all run their businesses in the same area. Yet the archaeological excavation has shown that the description is accurate in many respects. While it is not often that specific trades can be identified through archaeological remains or artifacts, in this instance the evidence can be used to identify the Store, Butcher and Baker. This only leaves the tailor and shoemaker to fill the other premises. Behind the Butcher, there were a number of yards and shelters for stock, which may suggest some animals were butchered on site. The archaeological evidence also suggests that workplace and residence were placed next to each other. Apart from the Store, there are three other distinct pairs of buildings. The Store was probably large enough to be both residence and workplace combined, but the others were placed in separate, yet paired buildings. There was a greater separation between the residence and workplace of the baker, probably because of the fire risk associated with his trade. Assuming that the interpretation of the paired buildings is correct, then the tailor and shoemaker are the only other trades necessary to fill up the available buildings. As with the other excavations, the traces of the buildings were very slight, though most could be clearly defined through post-holes and wall slots. The fireplaces were the most obvious vestiges of the former buildings, but even the semi-Scotch bread oven was demolished to a single course of brick. In fact, it was not until comparative analysis was completed that it was possible to identify it as a bread oven. In spite of the historical evidence that a number of the storekeepers went bankrupt, including Alured Clarke and later Benjamin Derrett, the shopkeepers as a whole possessed a high level of affluence, similar to mine management, the hotelkeeper and the more senior miners. Although the historical evidence provides one means of comparing the social and economic position of the different members of the Cadia community, the artifact assemblages provide us with another avenue of investigation. The Cadiangullong Store was one of the largest buildings excavated in Cadia Village. It measured 19.3 metres long and 8.7 metres wide (63 feet 6 inches by 28 feet 8 inches), excluding awnings or skillions. The dimensions are similar to the largest buildings in the 1861 Inventory, especially when it is realised that the central row of post-holes and the roof lines in the historical photographs indicate its width has been doubled. The Store and other shops were occupied from the 1860s through to the 1920s and 1930s. The decrease in artifact deposition in the 1870s and 1880s may again point to the tighter economic conditions in Cadia Village after the mine closed in 1867-1868. 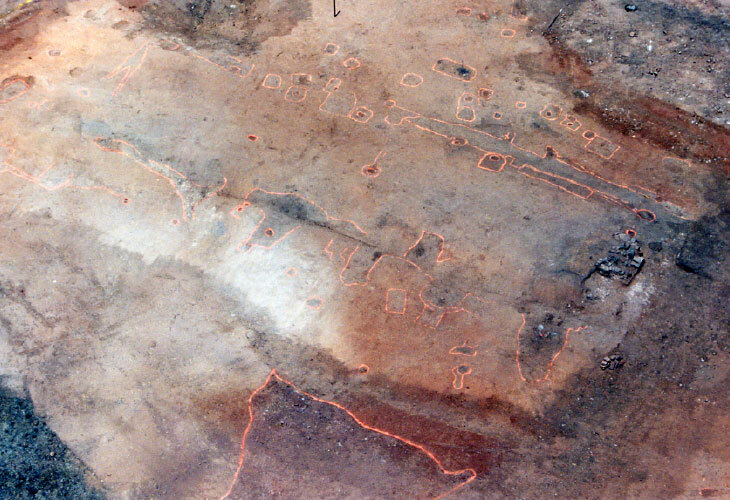 This aerial view of the excavations has been shaded to show the locations of the buildings found during the archaeological excavations in 2002. 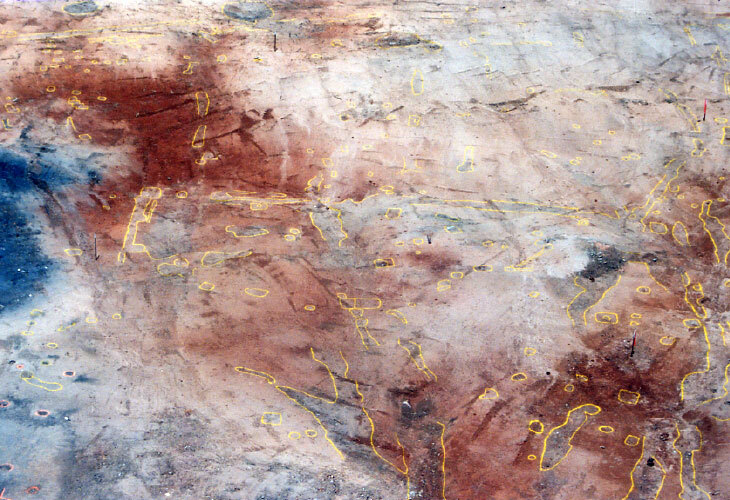 The buildings are identified on the excavation plans, where their functions are known (Edward Higginbotham, 2002). 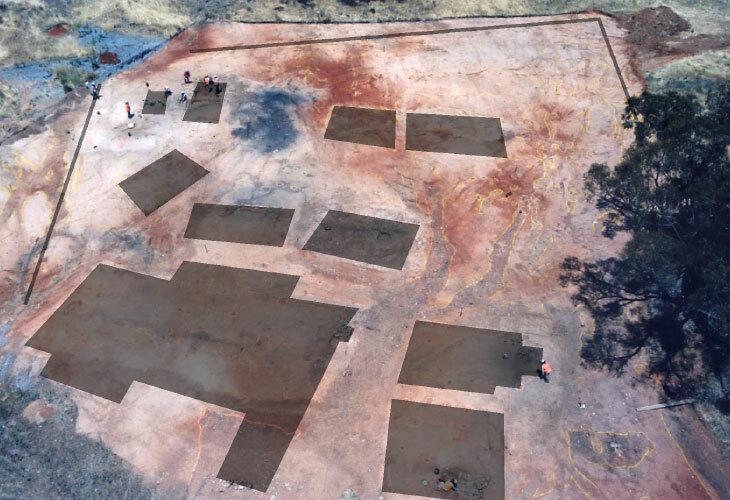 The outline of the footings of the Cadiangullong Store can be clearly seen in this aerial view as soil discolourations, marked with orange survey paint to ensure they remained visible when the soil dried out in the drought conditions. A few stones survive from the fireplace on the right (Edward Higginbotham, 2002). The footings of the Butcher’s Shop and Residence are marked with yellow survey paint across the middle of the photograph. On the left is the spread of ash from the baker’s oven, located out of the picture to the left (Edward Higginbotham, 2002). From ground level the remains of the buildings are hard to see. In the foreground is one of the shops (S149), while Cadiangullong Store (S016) is in the background, with its fireplace near the site planners. Compare this photograph with the excavation plans to see the buildings more clearly (scale 1 metre) (Edward Higginbotham, 2002). These brick footings were not clearly understood during the excavation. 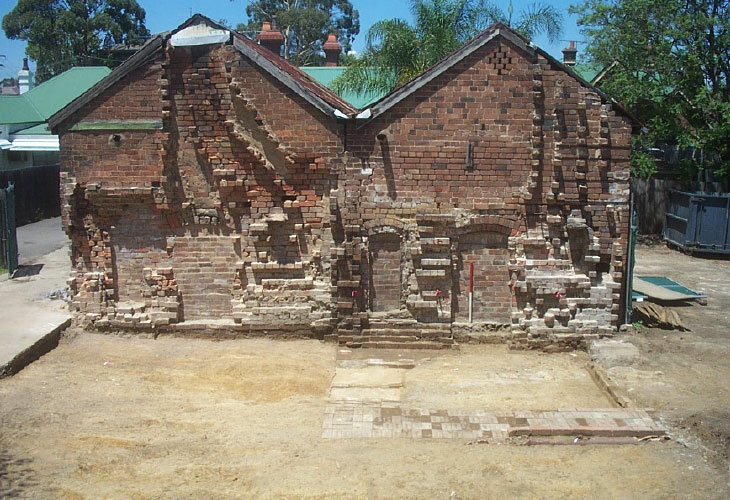 Their function was recognised when they were compared with the footings of a semi-Scotch bakers oven in North Parramatta (scale 1 metre) (Edward Higginbotham). 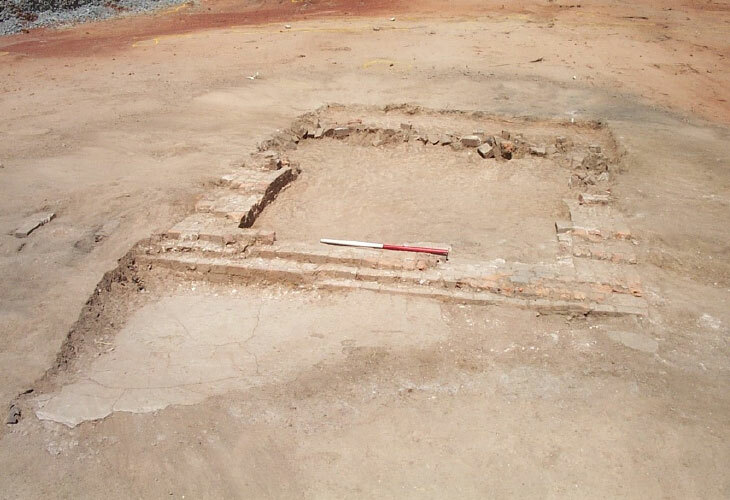 The excavation of the remnants of two semi-Scotch bread ovens at 8 Grose Street, North Parramatta, reveal the similarities with the footings found at Cadia Village (scale 1 metre) (Edward Higginbotham, 2004). 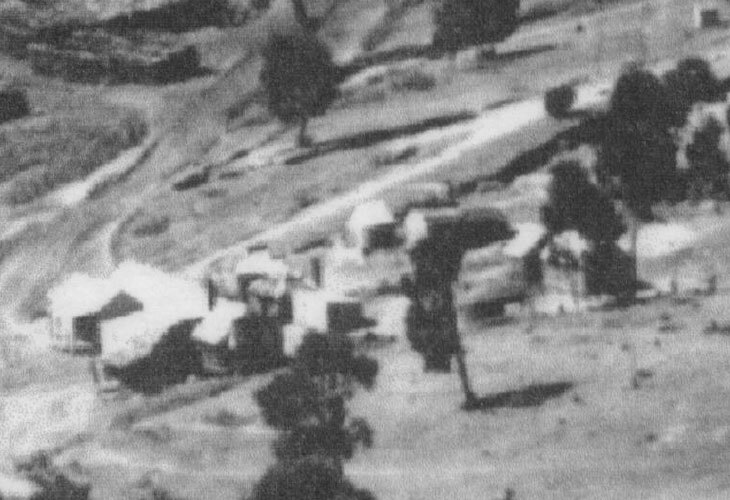 This detail of the 1905-1907 photograph of Cadia Village shows the buildings of the Village Centre, including the Cadiangullong Store (French Collection).